The goal of this mod is to automatize, as much as possible, the lights of your vessels (and of kerbal's helmet). This mod rely on the light action group to determine which light belongs to which group, in stock KSP you can change action group only in the editor, so no lights on all crafts already launched will react to the sun rising/falling. To change action group in flight you will need the mod Action Groups Extended, by @Diazo. By default its navigation and strobe light will get turned on at night using the custom blinking light provided by AviationLights, flash, double flash, interval. This is configurable, per light, in the setting file. How to modify how it works ? There's also some extra option for the Morse Code message. Due to limitation of the stock settings menu (or limitation to my modding skill :p ) it's a bit tricky to access it : in the settings screen enable the "More Morse Settings", hit accept, twice, and you got it. Here you can change the morse message send by distant vessel as you approch them. And the timing for the different symbol (they are sync to the dit duration unless you check manual timing). Lights on kerbal's helmet don't turn on/off as the sun rises/falls. Lights will be turned on if the kerbal disembark in the dark but status of the sunlight won't be checked after that. The range sphere of the Motion Detector is offset from the light position only for the stock light, for others the sphere center is at the light position. Report it to Github or on this thread. This is my first mod for KSP and one of my first working C# code, I've tested it on every situation I could think of but it may have bugs left. Very cool idea, the blinking when approaching stuff. 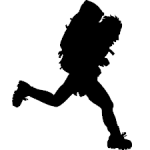 It should be available on CKAN not before long, my PR has just passed the test. 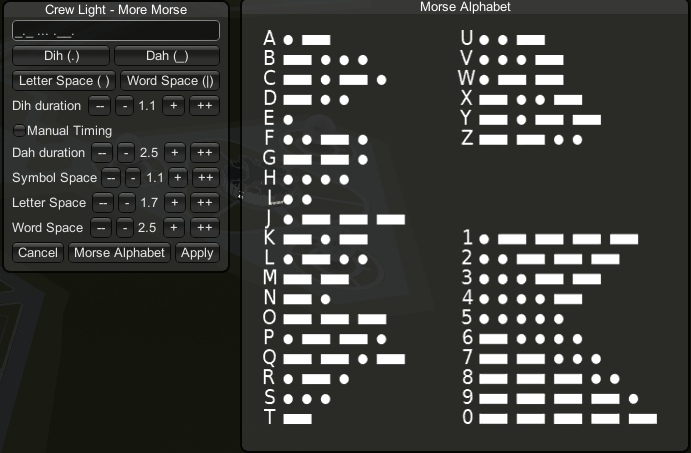 I like this Morse code blinking, really cool! You're welcome, thanks again for the idea of the lights responding to the sunshine, now the coolest part of the mod IMO. Seems like a good quality of life mod. Might get added to my stock save. Can you detect if a kerbal is in shadow? I like to turn on the helmet lights if I'm working in the shadows, in orbit or on the surface. Yes and no : depends on where the shadows are coming from, shadow from terrain/planet/moon are detected but those from vessels are not. And helmet's light won't be updated while on EVA, I couldn't figure out how to make it working while time-warping so I disabled it. They are toggled on/off depending on the sun only when a kerbal disembark (and when (re-)loading a save). Personally I like to have them always on while in space (because you know, space is dark and full of terrors ). always_on_in_space = True do that automatically (False by default). Thanks to you and to @Kottabos for the review, that was quick (actually the first version of the mod is from October 21, a little more than 3 hours ago ). The lights who respond to the sun are toggled too late : I'm worried about performance so I check for the sun position every 1.5s, it feels good without time-warp but I agree it feels off at high time-wrap, I can expose the settings for the delay easily but it would be better to change the delay to 0.1s or so when in time-warp. Lights get added back to action group when reloading a ship in the editor : good catch, I've done most of my test with AGX installed so I may have missed something for stock game, or is it a stock bug ? Toggling lights while on EVA toggle all symmetrical lights : I wanted to take care of that before release but completely forgot, will do. Morse Code isn't a proper message : Actually it is, but the delay for the "ti" and the "taah" are too close, it's configurable but I'll change the default setting. Can the dusk/dawn light toggle be slightly randomized, so that not all the lights turn on at the exact same time? Sounds like a good mod to me. Will check it out now. As to the delay, how hard would it be to scale it according to timewarp, so that it would be checked every, say, 1 game-minute (every 6 seconds under 10x, 0.6 seconds under 100x etc.)? It should also probably be switched off completely under very high timewarp (10000+), because it would make no sense when time of day changes almost every tick. Not sure what you mean exactly, should all vessel's lights be toggled at the same time after a random delay when the sun goes down ? Or do you mean each individual light should be toggle one after another with a random delay between them ? I like the first, not sure about the second, I'll try, see how it looks. On my last build, not released yet, I use a 1.5s delay between Raycast when time-warp is less than x5 and a 0.1s delay after that. I don't disable it when time-warping at more than 10000 but it's a good idea. Just an idea that if you have 20-30 lights in the scene, that maybe they should toggle in a staggered fashion over a period of a few minutes instead of 20-30 lights toggling at the exact same instant. Not sure if it's feasible to do or not. It is possible, I think a period of few minutes is too much tho, a few seconds between each light will be better. From what I know the suncatcher of the solar panels is very robust in this field. I don't know the code, but solar panels always know when sunlight is available, and they do it at superwarp speeds. True that. I think solar panel rely on Vessel.sunLight (return true if the sun is up). I don't use it because it doesn't take into account the terrain, so I wrote my own raycast which cast on the layer I wanted to (scaled and Local Scenery). For the issue about light action group being reset when reloading a craft in the VAB, noted by @Kottabos in his review, I couldn't reproduce it. If someone can, please share how. 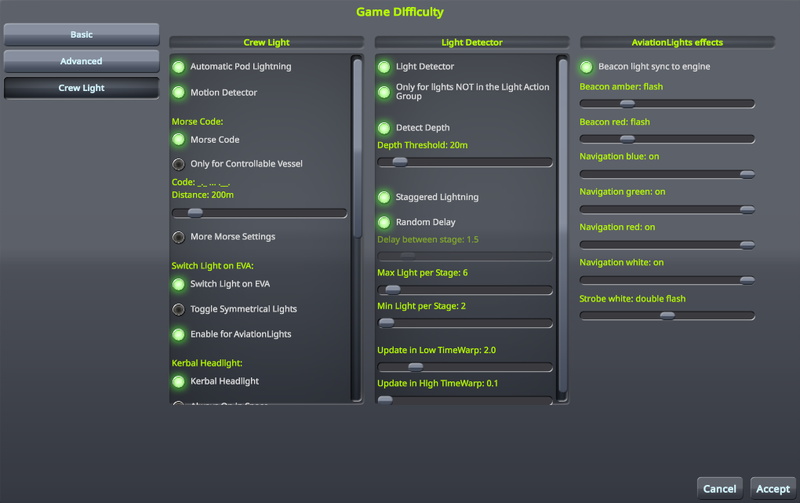 I'll try to randomize the lightning a bit in the next release as suggested earlier. Ten out of Ten! And throwing in a vote for WuphonsReachs idea of staggered lighting. I think them coming on in a staggered fashion as different systems trigger slightly out of sync with each other would just look so authentic as the automated lighting in our building here at work does just that. The outer building lights come on, then the entrance, then the parking lot and finally the rear of the building over the course of about five minutes. Now, I like the idea of a few seconds as in a game reality would be tedious. Maybe some type of extended grouping by function or type? Oh, by the way, on CKAN where I saw this mod pop up the homepage link just goes to the forum landing page, and not to this page. Thankfully the name was so perfect for this mod I just knew it would be worth the search! It's the little things like this that really add to the game. Thank you. For CKAN you right, I messed up my netkan metadata. I'll reach CKAN people, see how they can update it. At a time wrap of 10 000x or more it won't work very good (not much I can do about that) but the light should go to their correct state when time slow down. Can anybody confirm that it works with this mod lights? I was about to ask if you could add a function to remove a light form the "Lights" action group, but then realized that there's a link to "Action Groups Extended" in the OP. Which does all that and more.